If your PC is your main gaming system, it’s not complete without a great set of peripherals. You need a high-end gaming mouse for reliable, accurate targeting, and a great keyboard for handling your movements and commands. Sure, gaming laptops can provide decent keyboards for on-the-go gaming, but when you’re sitting at the desk, a full-featured stand-alone keyboard is simply the best way to go. All the models listed below are “mechanical,” meaning they rely on spring-activated switches versus the pressure pads used in “membrane” keyboards. They make for the best gaming keyboards, so we’d be at fault to recommend anything else. We don’t tend to recommend wireless keyboards for gaming due to latency and battery life concerns, but if ditching the wires is what’s most important to you, these are our favorite wireless options. What’s a gaming keyboard roundup without a product by Razer? Like Logitech, Razer takes the proprietary road with this keyboard by using its in-house “Green” mechanical switches. Built specifically for gaming, they provide a distinct audible click and a tactile bump for gamers who require feedback from key presses. Razer also sells the BlackWidow Chroma V2 with its silent “Orange” (tactile) and “Yellow” (linear) switches too. Feature-wise, Razer’s keyboard includes five dedicated macro keys, but no media keys. It does include a USB pass-through port though, that’s complemented by jacks for audio output and microphone input. All keys can be programmed through the company’s Synapse desktop software along with Chroma-branded backlighting supporting 16.8 million colors. The keyboard includes a detachable ergonomic wrist rest for long gaming marathons. This portable mechanical keyboard comes without a number pad, making it compact and streamlined. The Logitech’s primary focus was to improve the duration between touching the key caps, and the parent PC’s receipt of the keystroke command. That journey starts with using Logitech’s proprietary Romer-G mechanical switches with a shallow 1.5mm actuation point and ends with the data transferring to the host PC at a rate of 1,000 times per second. Logitech says this keyboard is ideal for esports professionals. Notable features include a detachable USB cable, 26-key rollover (meaning it can identify 26 simultaneously pressed keys), per-key RGB lighting supporting 16.8 million colors, and profiles for more than 300 games already loaded via the Logitech Gaming Software desktop program. There are no dedicated macro keys, but you can assign macros to the keyboard’s function keys (F1 to F12). The BlackWidow X Tournament Edition ditches the numpad but keeps all the great high-end features of Razer’s other gaming keyboards. It’s based on the company’s proprietary “Green” switches sporting a tactile and “clicky” feedback. These switches are backed by per-key RGB illumination, and a durability of 80 million keystrokes. They’re installed in a military-grade metal foundation for an attractive, sturdy solution that will last for years to come. Unlike its larger BlackWidow brothers, this model doesn’t include dedicated macro keys. Instead, you can assign these commands through Razer’s Synapse desktop software. There are no media keys either, so all media-related functions are pushed through the function keys. Other notable features include 1,000Hz ultrapolling, 10 key roll-over, cable management routing, and support for Razer’s Chroma illumination platform, which synchronizes colors and lighting effects across all supported Razer devices. The Corsair K63 is a small, but capable mechanical keyboard that’s built for easy transportation, and relies on Cherry MX Red switches complemented by a sole red per-key illumination. There’s nothing wrong with having a single color versus a palate of millions: Red illumination is better than no lighting at all. The K63’s red lighting is backed by key caps with large fonts so you’re not fighting to locate keys instead of the on-screen opponents. Due to its size, you won’t find dedicated macro keys. Instead, you can record macros using Corsair’s desktop software called Corsair Utility Engine (CUE). You can also use this software to create profiles that load when assigned to your favorite games, such as pre-determined key illumination, lighting effects, event assignments, key remapping, and more. 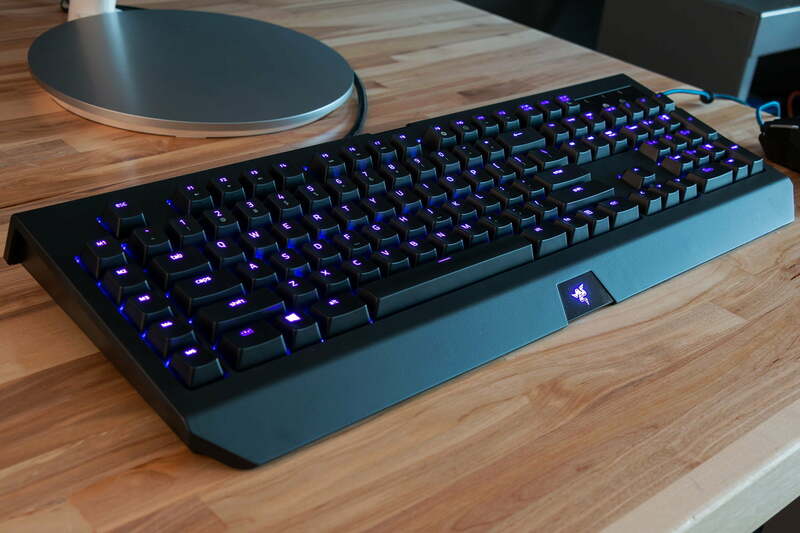 But Corsair’s affordable keyboard does provide a button to lock the Windows key, a button for setting the illumination at various brightness levels, and dedicated media keys. Technically, keyboards without the number pad (tenkeyless) the most compact keyboards out there, but Cooler Master’s MasterKeys Pro M is in a class of its own. It includes a number pad, but it’s shorter in width than the full-size “large” Pro L RGB version and wider than the “small” Pro S RGB version. Thus, this “medium” Pro M version seemingly combines the best of both worlds by merging the number pad, arrow keys, and the INS/DEL/END keys together into one solution. With the Pro M, there are no dedicated macro or media keys. On the macro front, you can assign commands to any key using the built-in “on-the-fly” system as seen with the other two models, or use Cooler Master’s own software. Meanwhile, all media controls are piped through the function keys. But like the Pro L and Pro S versions, you get RGB per-key backlighting, a 32-bit processor handling your keystrokes, and silent tactile feedback via Cherry MX Brown switches. Versions served up with Cherry MX Blue, Red, and Silver switches are available as well.